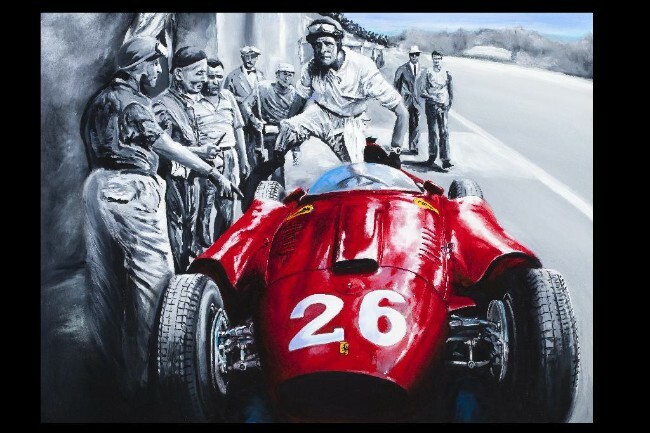 Peter Collins at the Italian Grand Prix, Monza 1956 - Original oil on board. SOLD. “At the end of the 34th lap there occurred one of the most stirring things in this most exciting of races for many, many years. Peter Collins, lying in third place, came into the pits for a tyre inspection, and voluntarily handed over his car to Fangio - thereby giving up any possible chance he might have had of winning the World Championship. It was truly a generous action, and one which gives the lie to the cut-throat tactics which one or two people have alleged against motor racing". “I was astonished when he handed over his car, but I did not stop to argue. In fact Peter pushed me into it, although he still had a great chance to win the Championship himself at the time. I know how much that renunciation had meant to him. This is one of the things that make a friendship really great. I don’t know whether in his place I would have done the same. Collins was the gentleman driver". Headlines around the world made him the hero of millions. 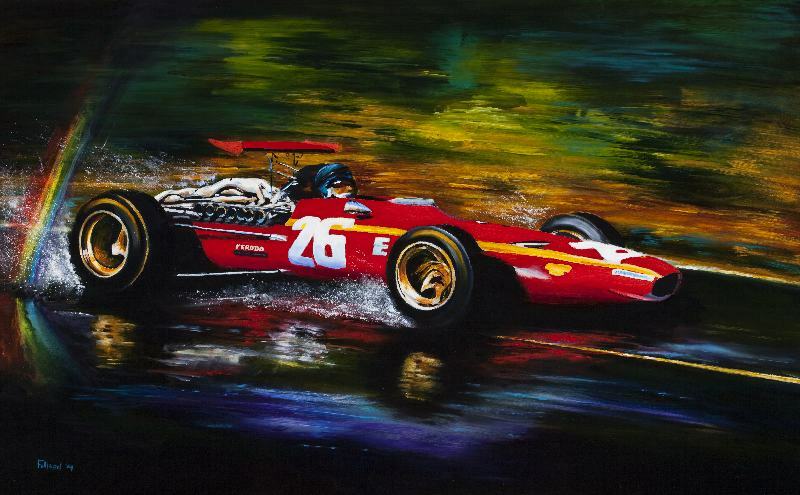 This features Jacky Ickx during only his second season in Formula one, driving the beautiful three litre Ferrari 312 in the Grand Prix staged at Rouen-Les-Essarts, France on the 7th July 1968. Having qualified third on the grid, he was one of very few drivers who opted for wet tyres when light rain was falling at the start of the race. At the end of the first lap, he was in the lead, and eventually won his first Grand Prix by virtually two minutes. Although an acknowledged Grand Prix master, finishing runner-up in the Championship to the late Jochen Rindt, he is more famous for his sports car racing, and is known as Mr Le Mans, a race he won six times.